Stylus', Stylii? Either way, we've reviewed our fair share of them. From simple devices designed to mimic holding a pencil, to others that have built-in brushes to mimic, well, a paint-brush. However, we've recently received the Pogo Connect by Ten One Design, a "Smart Stylus" using the power of bluetooth 4.0 to provide sensitivity to the pressure applied to the pen. Out of the box, it works just like any other stylus. It's smooth in hand, has a wide capacitive tip that allows easy use of it as an input device for the iPad. But to get the most out of the device, and the reason you'd spend the extra money on it, you'll want to download the Pogo Connect App from the App Store. With it, you can connect your pen via bluetooth, and it has a few other features, such as a handy "ping" feature which lets you see how close your sytlus is, in case it slips between the couch cushions or something like that. Outside of that, there's a User Guide built into the app, which is handy since you're likely not going to be keeping the box around. Once you've established the connection with the pen, the differences are still yet to be seen unless you're using a compatible app. There's a list within the app, some of the most notable are Paper by FiftyThree, Flowpaper, SketchBook Pro, Photoshop Touch and a good deal more. In most cases, (since I didn't have all of the compatible apps) you have to enable the Pogo Connect functionality within the app you're using it. I found getting Paper, to have trouble the first few times I attempted to connect, but once I "re-started" the pen, it was all good. Now does it work? For the most part, yes! Doing some A|B tests, you can see the subtle differences between when the bluetooth is at play. Mind my nasty bit of hand-writing, but you'll notice when it's on - there line starts off thin, but goes bold when pressure applied. 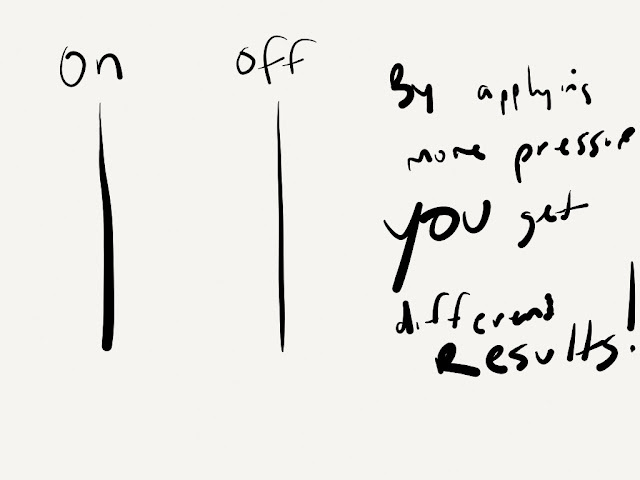 Off; you'll notice the line stays pretty constant. Notice also in the words, "By", "you" and "results", how they are much bolder than the others, there was more pressure applied in these instances. Now, I'm not an artist, this tool in my hands, will probably be underutilized, but I can see the potential for this device if you're doing artwork or using applications where a brush-stroke beats your finger any day. 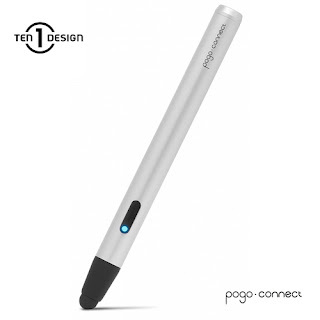 The TenOne Pogo Connect, SRP is $79.95; but Amazon has it for much lower, coming in under $60. We'd highly recommend this stylus over pretty much all others.